(Left to right:) Christopher Patrick Mullen, Trevor William Fayle, McKenna Kerrigan, and Kirk Wendell Brown in "Hapgood," through Oct. 14 at the Lantern Theater Company. In the first few minutes of Hapgood, Tom Stoppard’s 1988 attempt to marry a late-Cold War spy thriller to the mysteries of particle physics and human relationships, we have virtually no idea what’s going on. The opening scene in this Philadelphia premiere by the Lantern Theater Company takes place in the changing room of a public swimming pool. A man is shaving, and voices crackle over a shortwave radio. What follows is a minuet of doors of opening and closing, characters moving on and offstage, towels being thrown around, briefcases being exchanged – the elements of farce without either context or laughs. But what exactly have we witnessed? That’s the question the rest of this 2½-hour, two-act drama, directed by Peter DeLaurier, sets about answering – more or less. Playing with reality, illusion, and the idea of doubling, Hapgood poses a series of conundrums: Is there a traitor in the British intelligence service captained by Elizabeth Hapgood (McKenna Kerrigan)? Who is it, and what is his or her motive? Who fathered Hapgood’s son, and will she and the father find romantic happiness? And what does physics have to do with any of this? The Lantern has a fondness for Stoppard (this is the theater’s fifth production of a Stoppard play) and for works with philosophical and scientific content. Hapgood shares with Michael Frayn’s far superior play Copenhagen, revived by the Lantern last season, a preoccupation with the metaphorical resonance of Heisenberg’s uncertainty principle and the wave-particle duality concept of quantum mechanics. The main problem with Hapgood is that it’s impossibly convoluted. Deciphering the tradecraft and scientific jargon is challenging, but nowhere near as complicated as following the web of the plot, as suspicion falls on first one character, then another. The Russian physicist Joseph Kerner (William Zielinski), now involved in British research for the 1980s “Star Wars” missile-defense system, is a double agent – at the very least. Stoppard also throws in multiple sets of twins (how many is part of the play’s murkiness). The doubling, a Stoppard tic, points to the unreliability and mutability of human identity. Kerrigan’s Hapgood (called “Mother” by her agents) is alternately commanding and vulnerable – a boss for whom underlings pine. Christopher Patrick Mullen is tough, smart and appropriately ruthless as Paul Blair, in charge of ferreting out the potential mole. Damon Bonetti lends swagger, humor, sexual charisma, and menace to his role as another British spy, Ernest Ridley. Zielinski plays the physicist double agent with tenderness, exasperation, and a delicate accent. Nick Embree’s turntable set is an elegant solution to the need for a large number of settings in the Lantern’s intimate space. Hapgood is something of a historical artifact, in the spirit of John Le Carré, about the final stages of a sputtering Cold War rivalry. Our current anxiety in regard to Russian election interference, complete with cyber-hacking, surveillance tapes, and clandestine meetings, may lend a veneer of relevance to this arcane, often frustrating work. 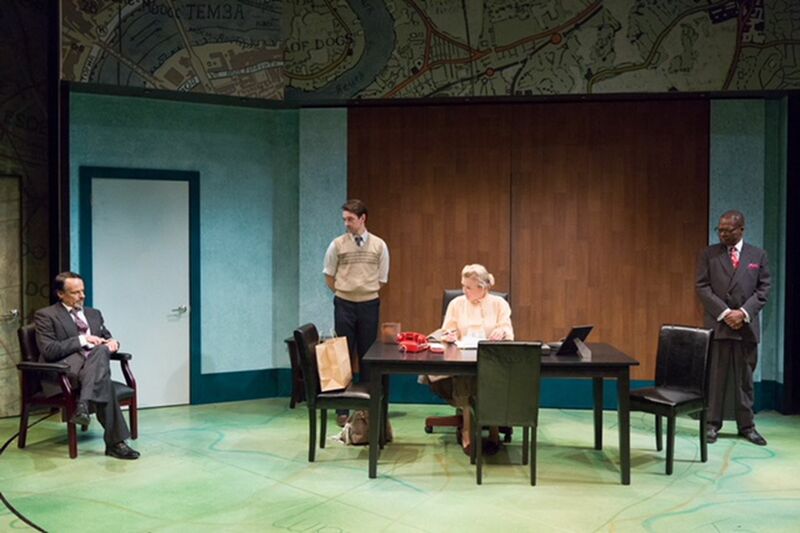 But the principal delight of the Lantern’s staging is in the thrust and parry of Stoppard’s vivid, imperfect, preternaturally articulate characters, of whose loyalties we’re never entirely sure. Through Oct. 14 by the Lantern Theater Company at St. Stephen’s Theater, 10th and Ludlow Streets. Tickets: $28-$43. Information: .lanterntheater.org or 215-829-0395.